IT IS ALMOST ‘trick or treat’ time and while Halloween is a fun occasion, some of the celebrations have their risks. The public has been advised by authorities – who stress they are not trying to spoil anyone’s fun – to be sensible this Halloween. Emergency services in particular have said they do not want to see a repeat of serious injuries they have seen in previous years. “It’s very sad for us when we see you injured on Halloween,” Dublin Fire Brigade district officer David Kavanagh told a group of school children earlier this week during a fire safety demonstration. 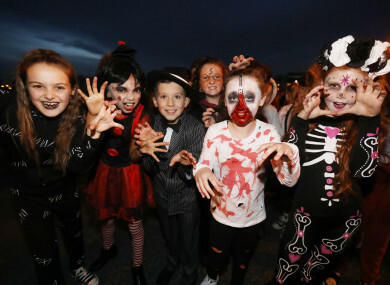 Dublin Fire Brigade issued a warning to members of the public not to put themselves in danger this Halloween. They focused in particular on the dangers of illegal fireworks and one of their firefighters demonstrated the serious harm they can do. Some of these fireworks are defective and can go off early, injuring the person who has lit them. Firefighters spoke of examples of children in particular losing fingers because of unsafe fireworks. They also showed schoolchildren how easily a bonfire can flare up, especially if someone adds even a small amount of petrol to it to make it bigger. If you are attending a bonfire, you should keep your distance – if you can feel the heat strongly on your face you are too close and could get injured if the blaze flares up. Equally, if you spot stockpiles of wooden pallets or other items for use in bonfires, you are asked to contact your local council – Dublin City Council has a litter hotline, 1800 251 500. Even at home, if you or your children are in costume, make sure you stay away from any flames like on candles or in pumpkin lanterns. Most costumes are highly flammable. Speaking of costumes, the Association of Optometrists warned against the use of ‘fun’ contact lenses as they carry serious health risks – and they are illegal. The ISPCA has also issued some advice for petowners, including ensuring your pet is microchipped and have ID tags. It is best to keep them in a quiet, secure room, where they cannot dart out an open door. Owners can also train their pets to become accustomed to the sounds of Halloween by playing sounds of fireworks at low volumes, and gradually increasing as the night draws nearer. As difficult as it may be, not reacting to your pet showing signs of fear may be the best way to help them. Licking objects such as toys filled with peanut butter may help ease your pet’s stress. If they are up for it, playing with them may also be a welcome distraction, but don’t force it if your pet is too upset to play. Keep decorations and sweets out of reach – remember chocolate and raisins are highly toxic to pets, as are any sweets containing the sugar substitute xylitol. The ISPCA has also recommended against dressing pets in costumes but if you are going to do it, choose something that won’t limit their movement, vision or ability to breathe. Stray animals can fall victim to abuse or cruel Halloween pranks. If you witness animal cruelty, the ISPCA is asking you to notify your local garda station immediately and contact the ISPCA National Animal Cruelty Helpline on 1890 515 515. Email “Everything you need to know to keep yourself, your kids and your pets safe this Halloween ”. Feedback on “Everything you need to know to keep yourself, your kids and your pets safe this Halloween ”.